The Ministry of Foreign Affairs hosted the diplomatic community consisting of commercial counsellors and honorary consuls of foreign missions to Sri Lanka for a briefing on the World Export Development Forum (WEDF) 2016 to be held in Colombo on 12-13 October. 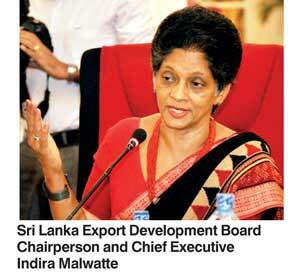 The meeting was led by Deputy Minister of Foreign Affairs Harsha De Silva, State Minister of International Trade Sujeewa Senasinghe and Sri Lanka Export Development Board (SLEDB) Chairperson and Chief Executive Indira Malwatte. Welcoming close to 50 delegates representing 39 countries, Deputy Minister De Silva commenced the briefing with the assurance of complete support by the Ministry of Foreign Affairs to deliver a rewarding and favourable international forum. The global conference, also the flagship event of the Geneva-based International Trade Centre (ITC), expects to bring in 350 international delegates and close to 300 local business leaders and entrepreneurs for the two-day event. Malwatte emphasised on the significance of the event asa platform dedicated to expediting business opportunities and partnerships with dedicated business-to-business (B2B) meetings. The B2B meetings between high potential buyers/ sellers will be facilitated at the event, catering to sectors such as tourism, information and communication technology (ICT), apparel and most importantly manufacturing, with the country currently heavily focused on investment in manufacturing for export. WEDF 2016 has also attracted some high calibre international speakers to share their expertise at the forum, including Secretary-General of the Commonwealth Secretariat Patricia Scotland, Executive Director of the ITC Arancha González, CEO of Central Eastern Europe and Middle East for DHL Stefano Arganese, Head of Customs and Trade Facilitation Policy at the International Chamber of Commerce Donia Hammami and many more. The local business community is also represented by visionary powerhouses such as Deshamanya Mahesh Amalean – Co-Founder and Chairman of apparel giant MAS Holdings, Ruwindhu Peiris – Head of start-up Sri Lanka, also driving the ‘1000 start-ups’ program, Dulith Herath – Entrepreneur, Founder and CEO of Sri Lanka’s largest e-commerce organisation Kapruka, and other likeminded industry leaders. WEDF 2016, themed ‘Trade for Success: Connect, Compete, Change’, will focus on current issues shaping business competitiveness, new markets and trade success. The forum has also brought Sri Lanka’s public sector and Government together with the private sector and the Board of Investment (BOI) in one great effort to ensure the success and continued interest and investment in trade relationships. The Sri Lanka Export Development Board (SLEDB) is the premier State organisation responsible for the development and promotion of exports. It plays a catalytic role in shaping of national economic agenda by being a policy advisor to the government for creation of conducive business environment. It interacts with the private sector by implementing programs for product and market development and promoting Sri Lanka export basket of products and services. It is the prime facilitator being the focal point for export development and provider of market intelligence to the business community. EDB has achieved the recognition and commendation as a friendly business partner from the private sector.